Fly to Ivalo (via Helsinki), located in the heart of Finnish Lapland. Transfer and check-in to your private log cabin and enjoy a hearty dinner at the resort restaurant. 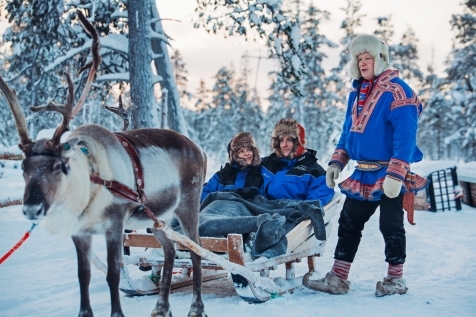 After breakfast, you will learn about the life of a Sami reindeer herder, then set off on a leisurely 4-hour safari with these beasts of burden. Travelling in your own sled, you will have ample time to absorb the atmosphere of the Arctic forest, as you snuggle under the warm blankets. A picnic lunch in a wilderness cabin is served, before returning back to Kakslauttanen. Dinner is at the hotel restaurant. Be sure to look out for the Northern Lights before returning to your cosy cottage. Today is at leisure. 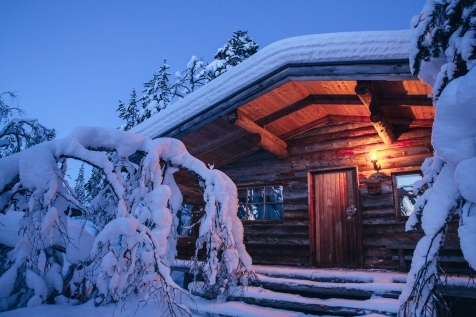 Try tobogganing, snow shoeing, cross-country skiing, or even alpine skiing in Saariselka. Early evening, you will gather to receive a snowmobile induction, before heading out (driving in pairs), to a spot on the fells, known locally as being an Aurora hot spot. Return to Kakslauttanen for dinner. After breakfast today, you will enjoy a thrilling 4-hour husky safari. 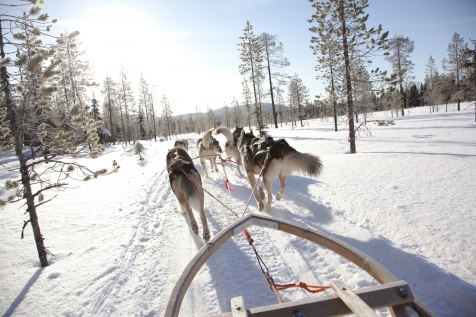 Travelling two to a sled, you each take it in turns to mush a six-team pack of huskies across the enchanting wilderness of the Urho Kekkonen Park. Lunch is al-fresco, around an open fire. On your return to Kakslauttanen, gather your belongings and head to your ‘igloo’. 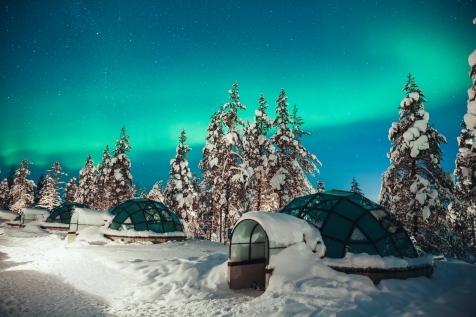 Heated to 21°c and constructed with thermal glass, the starstudded night sky is always on display, should the dancing lights appear, the Aurora Borealis too. Enjoy a sauna and breakfast before your shuttle transfer back to the airport in time for your return flight to the UK. Owner, Jussi Eiramo came to Kakslauttanen as a young man for a summer’s fishing and has stayed ever since. Today, the resort has expanded into 2 villages (East & West), each with their own restaurant and activity centre. This is an attempt to safeguard the character of this very popular resort, which has sometimes struggled with the volume of guests at peak times. This is not a luxury resort by any stretch of the imagination, the accommodation is rustic, warm and cosy, and there is a wide range of accommodation to suit all party and family sizes. 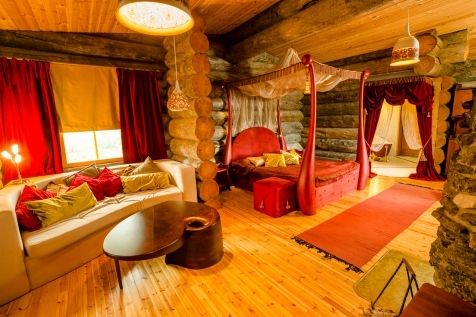 Deadwood pine log cabins sleep from 1-10 people. Sauna’s and log fires replace TV’s and dishwashers. A night in a glass igloo is almost mandatory. Heated at 21°c and with reclining beds, you can enjoy a comfortable evening of stargazing. Even if the Aurora does not appear, it is a magical moment when viewing the Arctic sky and colours. The larger glass igloos have a shower cabin, smaller ones have a small basin/private WC. Everyone has access to the sauna and showers in a separate building. The Snow Igloos offer a different experience with beds of ice and temperatures of -5°c, but your snug sleeping bag and reindeer skins keep you warm. And finally, we have Kelo Glass Igloos, an innovative and unique combination of a log cabin and glass igloo, which represents the ultimate private hideaway. Please note that your cabin could be located some walking distance from the main lodges, in which case kick-sleds are on hand to transport your luggage. Both east and west village have their own restaurants. When on the half-board option, you will have a choice of two or three simple yet hearty dishes for dinner and a dessert. There is an a-la carte option (supplement applies). Protective outer thermal clothing during excursions. Hire for the duration of the stay is available at a surcharge.